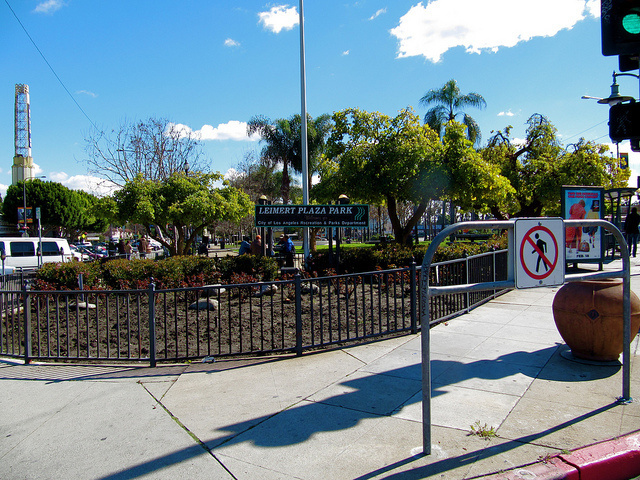 Image of Leimert Plaza Park. 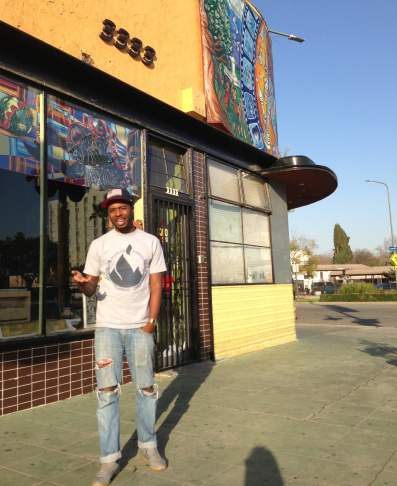 Rapper Nocando in front of the Kaos Network in Leimert Park. 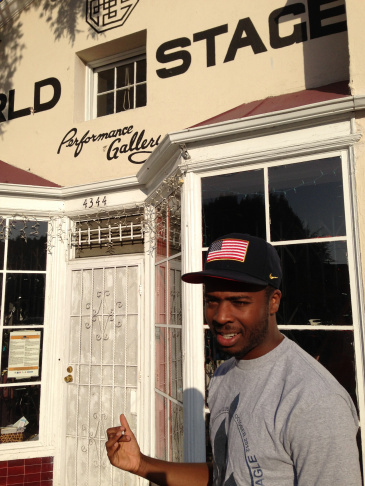 Rapper Nocando in front of the World Stage Performance Gallery in Leimert Park. 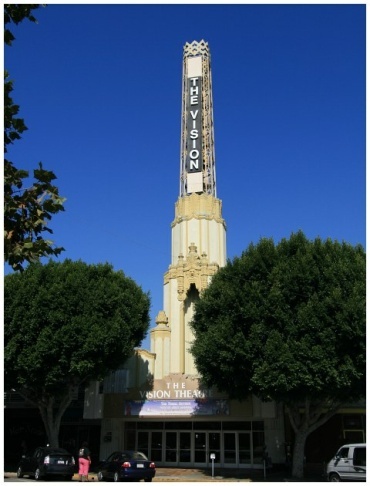 The Vision Theater in Leimert Park. Millions of people live in the city, occupying diverse neighborhoods like Little Tokyo, Echo Park and Glassell Park. But how much of the city do you really know? In Take Two's series, Neighborhoods, reporter Tess Vigeland takes us to Leimert Park in South Los Angeles. "The history that's more fascinating to me, is the history of the '20s, '30, '40s and '50s, of looking at the real strong cultural density of the artists. You can't name a black American artist who didn't live or work within a 5-mile radius of this place," said Caldwell. "Duke Ellington, Miles Davis, Ray Charles, Richard Pryor, he got his chops together here at Maverick's Flat. If anything, this is the Hollywood." So what made Leimert Park the meeting place for these famous musicians and creatives? "The first thing is the clubs, they had a strong club scene. Even when I was here, there was at least 10 clubs within a 2-block radius," said Caldwell. "From Reggae to Blues to Rhythm & Blues, to the total experience that had the high-end performers from The Impressions and The Temptations. All of that was within these few blocks." Caldwell himself has had a hand in bringing new music to these streets. He founded a performance space and community arts center called KAOS Network that helped breed acts from hip-hop artists Eazy-E and Yo-Yo in the '80s, to a decade later, Project Blode, an open mic night that spawned the careers of freestyle rappers like Nocando. "I really love this neighborhood, because it's the only place in Los Angeles where I can find good Jamaican food on the regular," said James McCall, better known as the rapper Nocando. "LA is kind of like, it's a melting pot, but somewhat segregated. If you are in the neighborhood where my studio is, Atwater Village, it's just like this, except for its not black." "Come to Leimert Park, go to Ackee Bamboo and get some good Jamaican food, go to the World Stage and listen to some cool jazz," said Nocando. "Right around the corner on Crenshaw there's like four barbershops, it's like the most competitive barbershop area, so it's pretty hard to get a bad haircut, bad barbers don't last here."